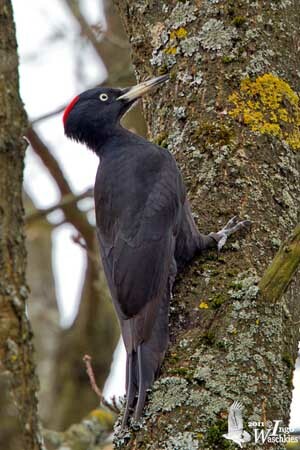 The Black Woodpecker is a large woodpecker of mature forest in the north Palearctic region. 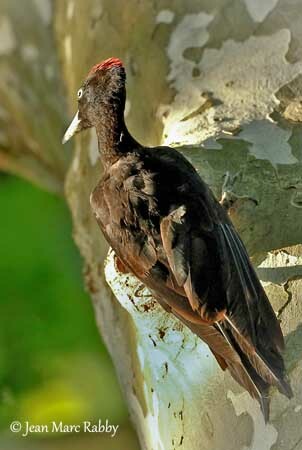 The adult male has black plumage with dark blue gloss on head and upperparts, mainly on wing-coverts. Primaries are tinged dark brown. The underparts appear slightly duller and washed grey. On the head, the male shows red central forehead to hindcrown, forming a patch ending to a point. There are some grey feather bases through the red ones. The bill is long, chisel-tipped with broad base. It is ivory-white with bluish-black culmen and tip. The eyes are whitish to pale cream-grey or yellowish-white. Legs and feet are dark grey to blue-grey. The bird is duller in worn plumage, with grey tinge below, and the red head patch shows dark grey streaks. The female is similar with less glossy plumage and reduced red head patch only present on the hindcrown. Forehead and forecrown are glossy black. She has shorter bill too. The juvenile is duller than adults, more sooty-black with paler grey throat. The red head patch is duller or paler with dark feather bases. The wings show brown feathers. Rectrices are shorter than in adults. The eyes are often bluish-grey and the bill is paler with grey tip. D.m. martius (here described and displayed) is found in N Palearctic in Europe, from Spain, France and Scandinavia, S to Balkans and N Turkey, and E across Asian taiga, to Kamchatka, Sakhalin and Japan, NE China and Korea, and also Caucasus and N Iran. D.m. khamensis occurs in SW China and Tibet. This one is blacker and has more glossy plumage. The Black Woodpecker’s territorial call is more metallic and higher-pitched than that of Eurasian Green Woodpecker “klee-klee-klee-klee…” or drawn-out “klee-eh” when perched. The flight call is a series of loud, piercing notes “prree-prree-prree-prree…” but it may also give softer “krük-krük-krük”. The alarm call is “kiyak”. During the breeding season, we can hear long series of more melodious notes “kweekweekweekwek-wik wik”. Softer sounds can be heard “kyak” or “rirrirrir”. Drumming can be long and the male drums more frequently. At nest, both adults perform loud, rhythmic tapping. 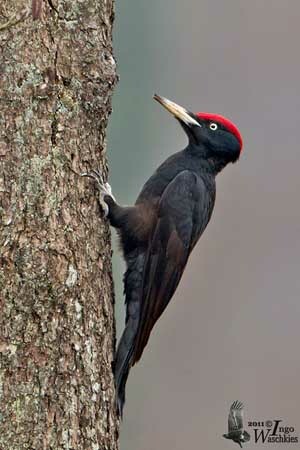 The Black Woodpecker frequents mature broadleaved or coniferous forests and large woodlands, and is also seen at forest edges. Outside breeding season, it can be seen in open areas, forest clear-cuts, and sometimes vicinity of cities. This species is visible from lowlands up to 2000 metres of elevation, but it occurs usually below 1200 metres, higher in Asia (1700-2000m) and China (2400m). The Black Woodpecker feeds mainly on ants and their brood. It also takes wood-boring beetles and bark beetles and their larvae, and other arthropods, and occasionally snails. It rarely eats fruits and berries. It often feeds solitary but both partners keep in loose vocal contact. They forage low on tree trunks and at base of trees on the ground. They climb straight on trunks and large branches, and rarely perches crosswise. It performs clumsy hops when foraging on the ground. 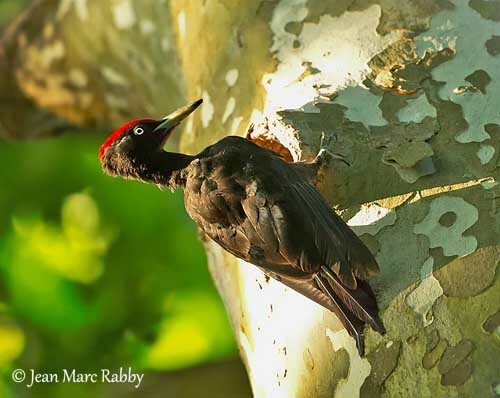 The Black Woodpecker chisels deep, elongated, rectangular holes into tree trunks, in order to reach invertebrates hidden in burrows in the wood. 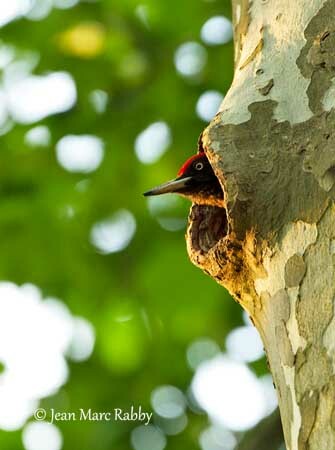 The woodpecker removes the bark and takes a look at larger pieces. It also drinks from sap. During defence and/or courtship displays, the red head patch is erected, enhanced by extended head and bill directed forwards. The tail is spread too. In more active displays, wings are dropped and the bird engages in swinging movements of both head and body. In defence, it flicks the wings widely, and in courtship, it holds them extended. Aerial displays are performed too, only for the mate. Several calls accompany this behaviour. Pair-bonds can be maintained in non-breeding season too, by vocal communication. They are cavity-nesters and the selection of the nest-site occurs at the beginning of the breeding cycle. They nest in excavated holes, often high in tree. The Black Woodpecker is resident in most parts of its wide range. Northern populations are only partially migratory. Some altitudinal movements are reported in winter in mountainous regions. The Black Woodpecker flight action is fluttery and irregular over long distances, but it is more undulating during shorter flights and before landing. The flight is usually slow, clumsy, with the head raised. Breeding season starts as soon as mid-January, due to long pair-formation and selection of the nest-site. The laying occurs from mid-March to mid-May. This species produces a single clutch. They need almost two weeks to excavate the hole in tall tree, usually between 5 and 10 metres above the ground, sometimes higher. The entrance is oval and vertical (13 x 8 cm), and the cavity depth may reach up to 60 cm. 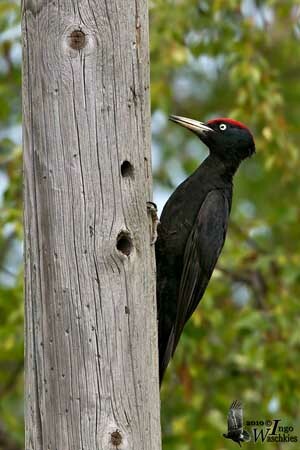 The Black Woodpecker may reuse old hole in tree or telephone pole. The nest-chamber is dug out into soft wood at the end of the deep tunnel. Wood chips are removed from the hole, by tossing them away with string sideway movements. The female lays 2-6 eggs and both sexes incubate during 12-14 days, the male mainly at night. At hatching, the chicks are brooded for the first week by both parents which feed them by regurgitation. They fledge about one month after hatching. They still depend on parents for one month more, usually fed by the male. The Black Woodpecker feeds mainly on ants (Camponotus, Formica and Lasius) and their brood. It also takes a variety of wood-boring insects and their larvae. Other arthropods and some snails are taken whereas fruits and berries are rarely eaten. It feeds on tree trunks and at base of trees on the ground. The Black Woodpecker is widespread throughout the range, except in the western parts where the species is locally common and uncommon in eastern parts. Habitat loss and logging are local threats, but currently, this woodpecker is not globally threatened. 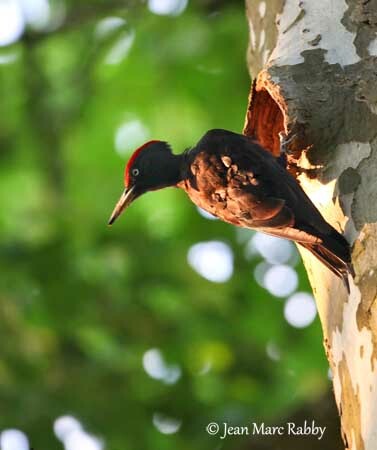 In N Palearctic, the Black Woodpecker occupies the same ecological niche that the large American woodpeckers such as Pileated Woodpecker and Lineated Woodpecker of the same genus Dryocopus.